Happy New Year!! And a big WELCOME to all of our new Panini Happy community members who received a panini press as a holiday gift – here’s to lots more fun grilling in 2013. 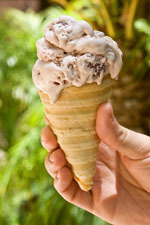 Are you in the mood for something a little on the lighter side? Yeah, me too. 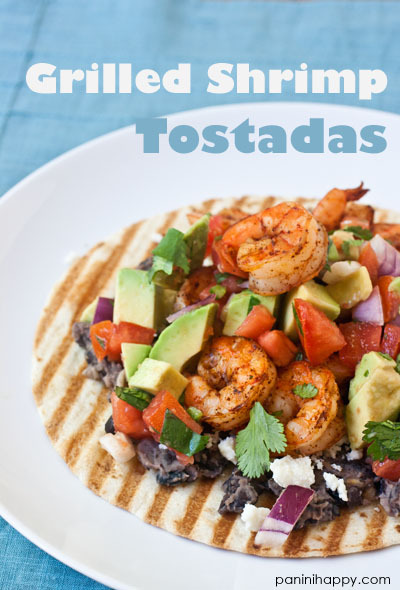 I’m pretty sure you’ll love these Grilled Shrimp Tostadas with Mashed Black Beans and Avocado Salsa Fresca – not only for their big fresh flavor, but also for how quickly you can pull them together. 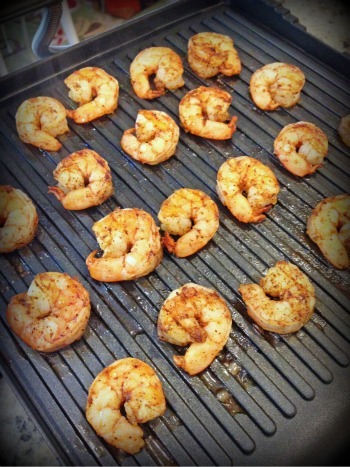 You can grill half a pound of shrimp on the panini press in about 90 seconds. That is reason alone to have panini-grilled shrimp in your regular weeknight dinner rotation, don’t you think? For these tostadas I first let the shrimp bathe in a chili-lime marinade before they hit the grill. Also grilled on the panini press: the tostada shells. You just brush a little oil on regular tortillas and after a minute or so on the grill they’re toasty, crisp, and ready for toppings. 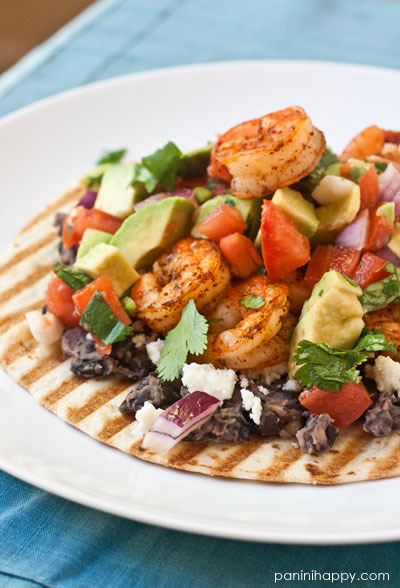 Black beans mashed with garlic (I love this technique from Rick Bayless) and sprinkled with queso fresco make a flavorful base to hold the shrimp on the tostada, and an avocado salsa fresca brings a punch of bright, southwestern flavor to the dish. Whether you’ve resolved to eat lighter in the new year or you just want to have fun trying out your panini press in a new way, enjoy these tasty tostadas! Avocado Salsa Fresca: Toss the avocado, tomatoes, onion, jalapeno pepper, cilantro, lime juice, and salt together in a medium bowl. Cover the bowl and refrigerate for 30 minutes to allow the flavors to combine. Mashed Black Beans: Heat the vegetable oil in a large skillet over medium heat. Add in the garlic and stir it in the oil for until it’s fragrant and just beginning to brown, about 1 minute. Add the black beans. Give the beans a rough mash with a potato masher (they should still be a bit chunky) and cook them for another minute or two until they’re heated through. Take the pan off the heat and stir in 1 to 2 tablespoons of water until the beans are spreadable. Season the beans with coarse salt to taste and partially cover the pan to keep them warm. Tostadas: Heat the panini press to medium-high heat. Lightly brush a tortilla with vegetable oil and transfer it to the grill. Sprinkle the tortilla with a little salt and close the lid. Grill the tortilla until it’s crisped, with golden grill marks, 1 to 2 minutes. Repeat with the rest of the tortillas. Keep the grill heated. Remove the shrimp from the marinade (discarding the remaining marinade) and put half of them on the grill. Close the lid and grill the shrimp until they’re cooked through and opaque, 1 to 2 minutes. Repeat with the remaining shrimp. Spread one-quarter of the Mashed Black Beans over each grilled tortilla (if they have cooled off too much to be spreadable, put them back on the stove over low heat for a few minutes and stir in water 1 teaspoon at a time). Top them with queso fresco, grilled shrimp, and Avocado Salsa Fresca and serve. Wow, that looks completely delicious! I love how light and fresh it is for this time of year. 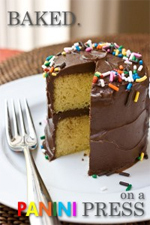 I was so excited to see this recipe after I saw you share the photo on Instagram. It looks so tasty and simple. I will definitely be giving this a try. Hope you had a great holiday! These are perfect. What a great combination. They’d be a big hit in our house! These look amazing. And, after all the heavy eating after the holidays – something fresh and light is just what the doctor ordered! I’ve been on a shrimp kick recently. Going to have to give this a try! Yes, please! Look at those beautiful grill marks! look great girl! Happy New year!! I couldn’t even read all the way through the recipe before my mouth started watering. This sounds so good!!! It is brilliant to use the press to toast the tortillas and then cook the shrimp. And I must try this salsa. BTW, I appreciate the very clearly written instructions;) A girl after my own heart. Just got a panini maker for christmas and it’s awesome! So excited to try some of your recipes. I see you grilled the shrimp on the panini maker. Do you have any trouble with the finish on the grill if you use it to grill meats? I’ve been worried to try it after cooking sausages on my griddle trashed the nonstick finish. Congrats on your new grill! I use mine to grill meats all the time. The two models I use – the Breville Panini Press and the Cuisinart Griddler – are both designed for meats as well as sandwiches. How did I not think of grilling shrimp on my panini maker? Brilliant! There are so many possibilities for quick and easy meals… so glad I saw this post! I think grilled shrimp will be hitting our dinner table in the coming weeks!